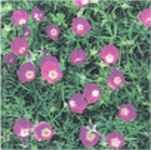 Tall Poppy Mallow (Palmleaf Poppymallow) Callirhoe leiocarpa - Upright, drought tolerant annual with dark purple to wine-red blooms which open during the day and close at night, remaining closed permanently after pollination. Native to Texas, Oklahoma and Kansas. Roots are edible and taste rather like a parsnip. Prefers a light sandy loam in full sun. Full sun; height: 3ft.